Reasons for concern: This plant spreads easily because it will break off at ground level and tumble across the landscape, scattering seeds for miles. It has rapid seedling growth and quickly takes over a habitat of native plants, reducing plant diversity so important to wildlife and pollinators. Botanical description: Tall, spindly herbaceous plant with large lobed leaves at the base and small yellow flowers on branching stems. Leaves: Lower leaves are larger, course and divided into broad lobes. Upper leaves gradually become much smaller and finer with shallow lobes and alternate along the stem. Seedling rosette has deeply lobed leaves. Stem(s): Stems simple below, but much-branched above, giving a bushy appearance. Dead stems persist through fall. A single stem grows from the base leaves (rosette), reaching as high as 2 to 5 feet. Flowers: Small, pale yellow, fading to white, arranged in clusters at the tips of stems. Blooms April to September. Seeds: In a very slender capsule 2 to 4 inches long. A single plant can produce over a million seeds. Roots: Slender, often branched taproot, with fibrous lateral roots. Where it grows: Roadsides, fields, waste areas, and disturbed soils at elevations of 3,000 to 8,000 feet. 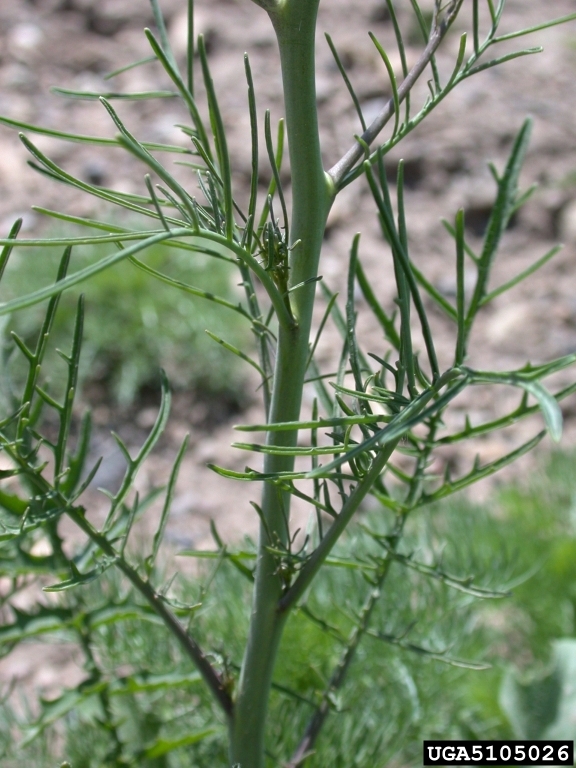 Weedy characteristics: Tumble mustard is a prolific seed producer, producing up to a million seeds per plant. Its seeds survive up to 10 years in soil. Tumble mustard establishes quickly after fire. Control strategies: Remove rosettes before they form stems; plants can be more easily removed when small. Step down any disturbed soil. Never let them go to seed. Bag flowers and seeds, if they have developed. Broadleaf-selective herbicides work on young plants for large infestations.